An elite level short sleeve jersey delivering an almost unfair advantage in the pursuit of speed. Tailored specifically with high performance aerodynamic fabrics the jersey is ergonomically shaped for aggressive riding with an extremely close fit to provide minimal drag. 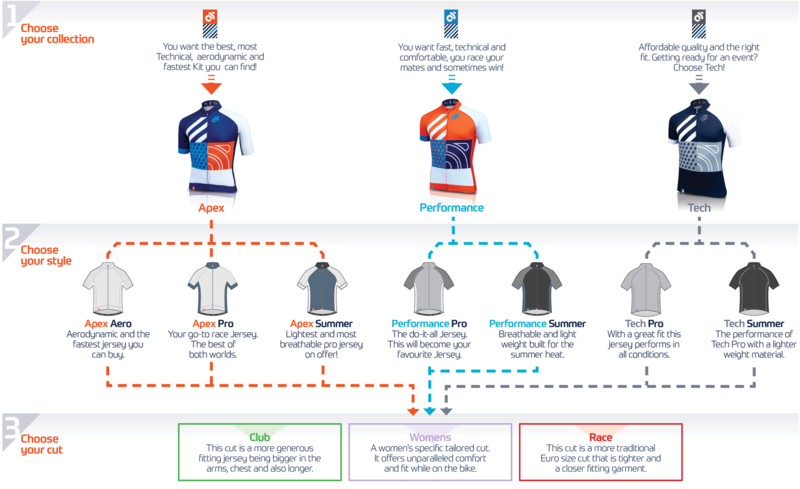 A jersey for the discerning rider seeking uncompromised performance, quality, comfort and increased aero benefits. Laser cut sleeve hem finished with internal silicone grip for a close fit and secure positioning. Silicone-injected deep hem providing incredible support to hold jersey firmly in place. Soft feel, tapered collar with zip garage for comfort. Also available with a half aero collar option for improved heat management and aero advantage. Our Elite garments are designed specifically for Professional Elite Riders – they are a tighter fit than our regular products. If you are interested in these products please contact our sales team to discuss. You can also order sample of these items for comparison. Due to the technical/breathability of the fabric used in our Apex garments, they do not offer complete sun protection. Please wear with caution especially on warm days.